The Faculty of Architecture and the Built Environment is proudly multinational. Ambitious and talented students from around the world expand their career options by joining the challenging architecture and built environment programmes at TU Delft. Our master’s programmes are underpinned by the renowned Dutch experience in architecture, spatial planning and the built environment professions, but have an international orientation drawing on the multinational faculty of staff and students. Drawing on the Dutch tradition of multidisciplinary practice, students at our faculty work in groups to create integrated solutions for the built environment. A unique combination of creativity, engineering and analysis with insights from social science, history and theory is used to tackle complex problems. The faculty is well connected to the design industry with renowned professionals from the Netherlands and abroad conducting courses, hosting workshops and delivering guest lectures. Graduates are well placed to work in the Netherlands and internationally. The faculty hosts much more than just architecture, with master programmes in urbanism, real estate and housing, building technology, landscape architecture and geomatics enriching the faculty. 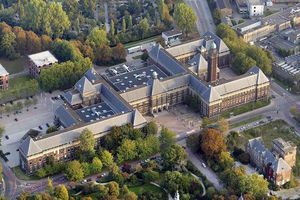 Post-master’s programmes include the famous The Berlage Post-master in Architecture and Design and the European Master’s in Urbanism (EMU). A master programme with five tracks: Architecture, Urbanism, Management in the Built Environment, Building Technology and Landscape Architecture. A post-master programme for advanced critical thinking in architecture and urban design. Graduate and experienced architects and urbanists are given the freedom to develop alternative models and theoretical insights into the built environment. En advanced post-master course delivered by a consortium of four universities. Students engage with the complexities of the design and planning of cities and landscapes, and gain experience of distinct approaches to integrating urban design and planning in very different contexts. The faculty building ‘BK City’ offers excellent facilities to serve the needs of the students. Completely renovated and used as a living lab, BK City includes an auditorium designed by MVRDV, model making rooms, two cafes and well lit studio spaces for students. BK City Guide: A handy reference to help new international students to find their way in and around the faculty.